I went to two sessions at the ICTEV Conference that explored software that enhances learning for kids with literacy problems, and was impressed. More than that, I think that any education system that is serious about making provision for all students (and has jazzy little slogans like ‘every child, every opportunity’ ) ought to provide funding for every school to have access to this type of software. It ought to be installed on every computer used by students, including in secondary schools. Make it cheap, and make it mandatory. TextHelp is an interface which works across many programs, with its own toolbar at the top of the monitor screen. The reason I think this program should be standard equipment in schools is not just because research shows that 20% of students anywhere everywhere have learning difficulties. It’s also because here in Victoria we have a large Non English Speaking Background student population, for whom this program has huge potential. When the student is using any MS Office program, TextHELP can intercede to help them with pronunciation, grammar, idiom and spelling. It can help with study skills like summarising – and solve the plagiarism problem with the click of a mouse. You have to see it at work to see the possibilities – it really is amazing. I was lucky enough to win the door prize, which was a demo copy of Dragon Naturally Speaking. This is speech recognition software which is ideal for people with dyslexia and is a million times better than the version that comes with MS Word. It has perfect spelling, and once it ‘learns’ your voice you can dictate email, spreadsheets and documents. Although it doesn’t work for everyone with a speech disability, it can in some cases also learn to recognise their speech so it is sometimes a brilliant tool for people with physical disabilities. What I really liked about it was that you can dictate a sentence, and then tell the computer to ‘scratch that’ – and it does! This software also has possibilities for mainstream students (or adults). Speech can be recorded on a digital voice recorder and then when you connect it to the PC, it automatically downloads and transcribes the recording. I could take a DVR with me when I walk the dogs in the morning, dictate a chapter of The Great Australian Novel as I go round the block, and Dragon would transcribe it straight to text for me! (I wonder what Dragon would make of the barking when we go past the big shaggy dog on the corner LOL). if you agree that these programs should be in every school. There’s More to Blogs than Blogging was a great presentation, all about moving on from simple blogging to more sophisticated use, and you can check out the presentation through this Wiki link. Oh no, I’m running out of netbook battery! PS From home, on Sunday. This really was an inspirational session – and I nearly didn’t go to it because I was tired and had already been to a session on blogging! John Pierce from Salty Solutions Educational Consultancy and Rick Kayler-Thomson from Bellaire PS had so many wonderful ideas, it’s hard to know where to begin. I loved the Passion Projects which have led to students continuing to blog on their area of interest even after leaving the school and going on to secondary college. Pete and Byro Films shows an extraordinary level of competence with animation and game-making – (and the Basketball game is horribly addictive till you figure out how to score a goal)! The Goss is a repository of student short talks on all kinds of jazzy subjects from dust storms to the Roswell Incident, all downloadable as podcasts. You can tell that the kids love doing this….could I get my act together to do something similar with the talks my Y5&6 students are doing for their Fame (Biography) projects? I shall have a play around on my practice blog to see if I can learn how to do it in time. (Having a practice blog is another idea recommended at the conference – I’ve had one since I did the Web 2.o course last year, and I’ve kept it to use whenever there’s something I want to try without mucking up my real blogs). The Puzzler Blog is another clever idea that is worth a try as well. A talented and enthusiastic teacher combined with consultancy expertise = fantastic opportunities for kids. I am so impressed by this team! Check out John’s blog as well. Check out these class blogs for beaut ways to enrich the blogging experience. Students have posted some very impressive work, but it’s the quality of the thinking processes embedded into the activities that’s innovative. Have a look at Brodie’s blog, for example, to see the quality of the writing and the depth of his thinking. I’ll be exploring this site in greater depth when I get home from the conference! The content includes text, video (internet, DigiLearn), websites, and specific units of work. Communicate with the school community: notes home to parents encourage them to make comments. Students need to create web links to their friends’ blogs and the classroom blog. Students need time after they have blogged to read other students’ blogs and leave comments. ICT – developing new thinking; students expressing themselves in contemporary and relevant ways; global and local communication; and reflecting on ethical responsibilities. Watch out for student surnames (in blog addresses in any published work within student classroom work that is uploaded or photographed). Be careful with photographs – school photos, photos inside classroom work displayed – parent permission is essential. Links on student blogs – watch out for inappropriate themes, ads or template names. Here I am at the ICTEV Conference at Melbourne Grammar, hastily updating this blog because I forgot to bring my netbook charger! Bruce Dixon (Director IdeasLab, Co-founder Anytime Anywhere Learning Foundation) gave the keynote address, and he was fantastic. He talked about so many issues I couldn’t keep up, but it was exciting. His topic was ‘Emerging Trends that Redefine Education in the 21st Century and Imperatives that are Driving Transformation’. He began by saying that our strength in OZ is our weakness – we take on innovation readily, but we don’t always consolidate. There are huge expectations of schools with the major new focus on education, it’s front and centre with our government but also around the world. We are challenged by needing to meet needs of the future because we’re not just being influenced by countries we’re comfortable with, now also the unfamiliar i.e. India and China (though Dixon didn’t name them). We all know the competencies we’re expected to develop: 21st century learners analytic thinkers problem solvers communicators globally aware civic engagement successful learners numerate articulate curious passionate literate collaborators, synthesisers, personalisers, localisers – and they’re just the ones I managed to jot down. But as we all know, it’s hard enough to achieve traditional competencies and now we need to expand on that. The Best Job in the World phenomenon is an example of this new kind of thinking that’s happening in the world. The creation of this ad (because that’s what it was) was clever enough as a means of advertising Queensland to the world but everything else in the thinking behind it, was based on 21st century thinking. It had a huge impact internationally, and the job application medium was video generating 36000 entries – how many of our students could have engaged in this process? They should be able to = tThis is the way the corporate world is working – skills demand has now shifted dramatically. Routine cognitive or manual job opportunities have vanished. Anything easy to teach and test is easy to digitize or make a robot for. School has to be different. But how? No school? Still subject based? Somewhere between these extremes? The frog is in rapidly rising hot water. Social and interactive aspects of schools are still very important. The Singapore classroom of the future (I need to find a link to this online somewhere) offers every teacher time there because they know they have to change. 1. Globalisation, More than global projects – just a first step – young Oz people more than any other country need to be connected globally – we are the most isolated country are in the world, we do not have a modern network yet – embarrassing lack of languages – we don’t have cultural understanding, and it’s very obvious in Europe. We need to make more use of phones, VOIP, SKYPE, time zones are a problem but not along our own time zone. More conference environments for young people should be facilitated. Open course ware project in the US – leading universities make available the lectures, PPTs, podcasts, videos etc. These should be used by students e.g. Prof Leewin(? )’s physics lectures. And these are available to kids in the 3rd world as well! Intimidated by web 2.0? It’s just a ‘toenail’ in the water of what’s ahead. FaceBook is why the world has a different perspective on Obama. There are new international ways of facilitating all kinds of things, including philanthropy through social networks. Those schools not letting kids use Google???????????? web 2.0 is the architecture of participation! ICTEV needs to lead the conversations, not Andrew Bolt! 3. Content v context. Current model is out of date, informal learning is eclipsing formal learning. Success in the future is being able to do what you were NOT taught to do. Kisa need to be able to do more complex things than before, things not previously accessible to children. Skilling people in low level word processing and excel is not what it’s about. It’s about how you can use the technology to improve mathematical understanding, Science and so on. Possible areas to develop are countless, but here’s one: possibilities for personalisation can address learner diversity. Flexible approaches to learning different learning styles – everyone wants to do this but teachers often burn themselves out trying to do this in traditional ways. With technology it’s possible. Kids can express their ideas with sound, animation, video, images and not just words. Not just expressing ideas for the teacher, kids can publish to the world, to a new audience. Digital portfolios, knowing prior learning – Ultranet may make this more possible. No one has done it yet, but the vision is good. Schools have been slow to change because the kids don’t have 1-1 computers – they have to have them! Victoria the first teacher in the world to give each teacher a laptop. We need to think differently. (Dixon is exhausting, but he has an important message and he sees the message is urgent). Technology is going to allow us to manage all this diversity, assess it formatively and so on. The PbyP learning cycle – web 20 and assessment through personalisation by pieces. Competencies – learners set the goals, submitted (like a PhD?) peer assessed at that level, and the level above. Accountability: people fear it – No child left behind program in the US emerged because of accountability – but we need to define what we want it to be. First and foremost we should be accountable to Kids. What have we been spending on education and what do we get for it? US spends more than anyone, 13th in the world, Korea is ahead of them. PISA is a picture of the value your education system is delivering. Most people in the world who achieve at the same level of America are low paid workers – not a great future to US – their GDP would improve if they got a better result from their investment in education. Jazzy new developments in Victoria? : e5, PDPs etc. Where and how learning takes place….’free’ time i.e. not at work or school, if we can engage kids to learn anywhere anytime – i.e. move them beyond print era to broadcast era to collaborative age = different environment. Publishing, social networks. Learning is not organised around a school – libraries are not a transformed space – whole new view of what they might be. 1.Technology increases pedagogical capacity. One hour a week access to computers is not enough! 2.What are we going to let go of? Not an add on, transformation. Spaces/ digital content/ digital pedagogies. 3. digital lifestyle 4. Paradox of universal education – media always telling us we’re not doing well, when in fact we are, though there are increasing numbers of disengaged students and these have to be able to do more. Technology can help us address this? These notes are a mess! Conference blogging is an art I need to learn! Like many others this past week, I’ve had the lurgie that causes laryngitis, and it just won’t go away. I had a week off to rest my voice, but it didn’t help much, and after two days back at work it’s just as fragile as before. So I was very pleased to be able to borrow a very clever little device called a voice projector. 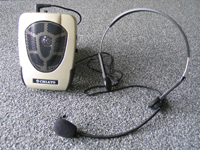 As it says on the website The Chiayo Personal Voice Projector is a “Walkman” sized, voice amplifier used to increase the speech volume of a weak voice. It is designed to be used in regular conversational situations where background noise is minimal. Of course no one in their right mind would describe a classroom as a ‘conversational situation where background noise is minimal’ but I am hoping that this device will provide that little bit of extra volume when I need it. The voice is the essential tool for teachers, as it is for lawyers, actors, broadcasters and a host of other professionals. Having had this problem some years ago I attended a course called ‘Care of the Professional Voice‘ at the CAE and for quite some time used the simple strategies that they recommended. Alas, time went by, I had no problems, and so of course I forgot to do the exercises, drank too much coffee, forgot to maintain good posture when talking to little kids, and used my voice the wrong way. Soundmask Australia has one of these designed for classroom use! 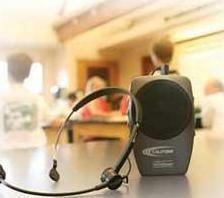 I saw it at the ICTEV Conference on the weekend, and it’s called a Califone VoiceSaver. I had feedback problems with the Chiayo voice projector if I went too near to the whiteboard or accidentally moved a book or piece of paper in front of the speaker, but the Califone apparantly doesn’t have this problem. Contact Megan at megan@soundmask.com.au for more info. I was much saddened to see from The Age Obituaries that the artist Kilmeny Niland had died on February 27th this year. She was only 58. Would any of us know the work of Banjo Patterson today, if not for Niland’s wonderful illustrations? She brought his poems to life and made them appealing for today’s children with bright colours and zany humour. The Age says that Mulga Bill’s Bicycle has never been out of print, and I still read it to classes who love it! Other books she illustrated include the enchanting Blossum Possum, Two Tough Teddies, and The Gingerbread Man. Her website still shows some of her work, and I hope her surviving family will maintain it somehow because it showcases her enormous talent and delightful sense of humour. The SLAV Bright Ideas blog has alerted me to an excellent article in the May edition of the AEU News (Victorian branch). It’s called On Borrowed Time. My school community is lucky that my principal understands the link between literacy and libraries. There’s mountains of research which shows how crucial it is, and anyone who’s taken more than a cursory look at what passes for a library lesson in those primary schools where the class teacher takes the children to borrow and a library technician processes the books, knows that it’s not fair to anyone to do that. The kids miss out because the class teacher has so much else to do that she can’t possibly know the bookstock, purchase quality texts, help the kids find the right book or have time to prepare a really good lesson week after week. Even those of us who really love books and reading (and not all teachers do) would find it difficult. I’ve been in my library for nearly five years now, and I read 4-5 children’s novels a month but I still haven’t read some of the novels that I need to, in order to help those kids who are struggling to borrow something they’ll enjoy. Schools make hard choices because they have to. If we were really serious about an education revolution, we’d restore funding for teacher librarians, and schools wouldn’t be able to spend it on anything else!